10.4" diagonal, sunlight readable 256 color TFT SVGA big screen, 600V x 800H pixel resolution, 12 parallel channel GPS with selectable WAAS reception and internal hard-drive with detailed US inland and coastal mapping data. GPS + WAAS navigation moves way ahead in viewing, performance and convenience with special new Lowrance Global Map technology advancements. Along with the new super-high resolution, sunlight readable 256 color TFT SVGA big screen viewing, this model has a rugged built in, shock resistant 20 GB internal hard drive, preloaded with all the exquisitely-detailed mapping and charts you could ever need for coastal and inland navigation in the continental U.S. including enhanced shorelines, nav aids, depth contours, major and minor roads, and over 2 million Points of Interest. Plus each features NMEA 2000 compatibility for networking, Ethernet expansion port for radar, audio output for remote speakers, and greatly enhanced processing speed! The Global Map 7600C HD comes with a 10.4" diagonal screen with incredible 600V x 800H pixel resolution. Other features include: Precise 12 parallel-channel GPS + WAAS positioning with the LGC-2000 receiver antenna, Digital media memory card slots to record GPS trip details and to display a superb variety of high-detail plug and play electronic chart options, Up to 100 savable and retraceable plot trails with up to 10,000 points per trail, 1000 waypoints/1000 event markers, 42 graphic icons, GPS alarms, 37 map ranges, .05 to 4000 miles and Back-up memory. Comes with a screen and keypad cover. Completely sealed and waterproof. Full one year parts and labor warranty. Lowrance Instructional DVD by Doc Sampson is available to help you understand your new Lowrance. Compatible with new Lowrance Lakemaster 2007 and Navionics Hotmaps Premium 2007! Package includes 7600C HD, external GPS antenna, power cable, mounting gear. 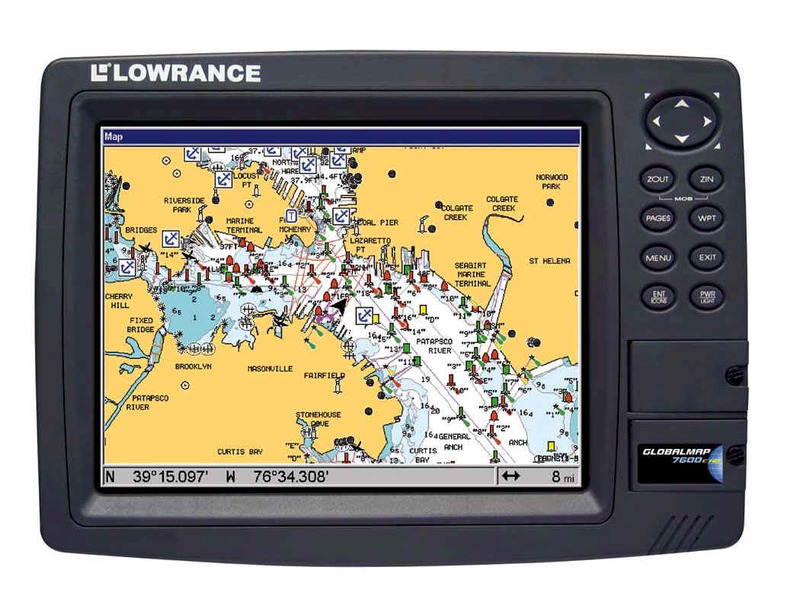 To order the Lowrance GlobalMap 7600C HD GPS, add to cart. Lowrance GlobalMap 7600C HD 117-35 Sold out! Email jollyannmarine@gmail.com with questions. Free Shipping! In stock today! We highly recommend Navionics Hotmaps Premium maps for freshwater lakes or Navionics Gold Charts for Great Lakes and coastal waters. Need a matching fishfinder? We recommend the Lowrance LCX-112C or the LCX-27C.